This delectable Pinot Gris is brought to you by Frenchman Laurent Montalieu of Bordeaux. Ooo la la la. Review: This wine has a lovely pale straw color and aromas of pears, juicy nectarines, soft white flowers, and a hint of citrus. On the palate it is the a bit off dry, lending the wine a soft round body. The presence of brisk acidity keeps the sugar from taking charge -- the balance here is just perfect creating refreshing sip after sip. Fruit flavors of pears and nectarines are quite pronounced, along with some spicy crystallized ginger. The wine has a medium length finish and a stunning freshness. Food Pairing: Perfect with spicy sushi rolls. Bottom Line: This Pinot Gris is all I want it to be -- soft, supple, and refreshing. Where did I get it? Special Order -- call your local wine shop today! 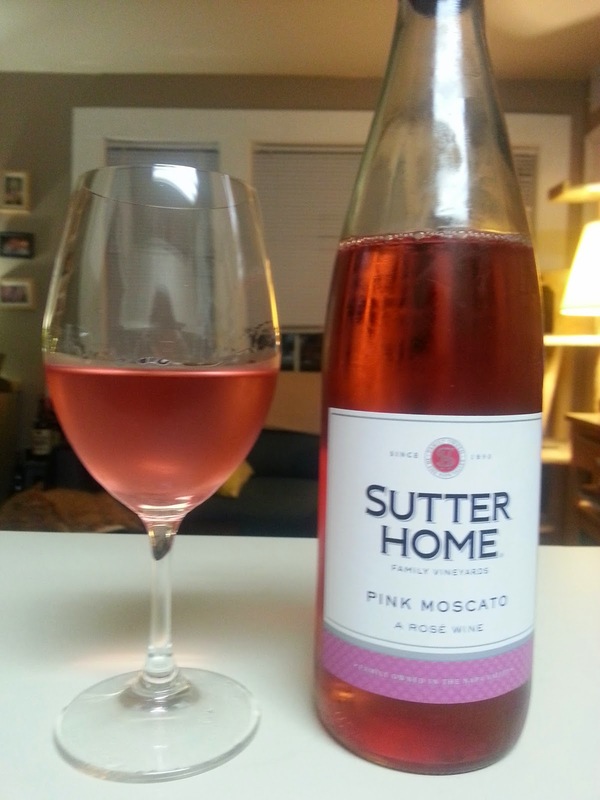 Review: The Pink Moscato is certainly pink! However, it smells nothing like Muscat -- a highly aromatic grape with floral, honey, and "grapey" notes. Instead I'm getting light candied berries and that's about it. On the palate it is definitely sweet. It's missing acidity that would keep it refeshing, making for a flabby wine. The flavor is sort of like cherry Sucrets. I know this isn't a flattering review. But I've got to say this isn't terrible. If it were ICE cold, this would go down like water. Sutter Home specializes in mass produced, hyper-drinkable wines. This is most certianly that. Their parent company, Trinchero, say "Sutter Home is America's favorite wine, offering outstanding value from some of California's best wine-growing regions." In order to make this one, though, they sourced grapes from Argentina. The wines from Finca Decero are some of my favorites. All are from single vineyard sites high up in the Andes and are grown and vinified with care -- hand picking in the vineyards and gentle handling in the winery. This allows for delicate flavors to truly shine. Review: This Malbec is gorgeous dark ruby color. It has aromas of ripe black cherries, violets, anise and cloves. On the palate it is dry with medium high acid and a slight alcoholic burn. The tannins are present, but soft and resolved. The wine shows rich flavors of berries, red plums, baking spices, freshly turned earth, and licorice. It has a medium long finish with a hint of black pepper. For me, this wine does come off a little boozey. It's 14.5%, and while it is balanced by bright acidity and integrated tannins I think it needs food to help it mellow. Food Pairing: Steak, of course, goes great with Malbec. But if you wanted to mix it up, I would pair with some grilled portobellos or eggplant. Basically, just go with something meaty. Bottom Line: Beautiful wine. Great fruit flavors and spice. Add food and friends and you've got yourself a good time. This off dry white hails from Salta, the northern most wine growing region in Argentina. This warm, dry climate and rocky, sandy soils translates to grape stress. And when grapes are stressed they have the potential to produce some flavorful juice! Amalaya one of several Argentinian arms of the California based Hess Family Estates. Review: The nose is intoxicatingly floral -- in a good way -- with notes of gardenias, honeysuckle, ripe melons, and white grapefruit. On the palate it is a touch off dry and highly acidic, with a silky soft texture and flavors of ripe pears, and citrus zest. The finish has a nice lingering note of honeysuckle and minerals. This is sure to be a crowd pleasing wine -- balanced sugar and acidity, flavorful fruits, and concentrated minerals. Oh, and it's under $15. Food Pairing: Mildly spicy Indian curry. Yum. Bottom Line: I love the zippiness, brightness and minerality. Summertime in a glass. A great value. The Rex Chronicles are back! A few weeks ago I got to experience their Pinot Grigio, and tonight I bring you Issue 2 of the Rex Chronicles: Shiraz. Review: This Shiraz has aromas of dried blackberries and mint. On the palate it is off dry, light bodied, and a little burny (the booze is only 13.5%, but it feels a lot higher). I found flavors of blackberries, plums, and some barrel notes: toast, sweet spice, and cedar. These toasty flavors seem quite persistent on the finish. I find this wine to be out of balance -- too much booze, barrel notes not integrated into the wine. The producer's notes indicate the intention of a "healthy dose of oak". For me, this is unsuccessful and a bit harsh. Bottom Line: All that being said, this rooster is surprisingly drinkable. The lightness of the wine, even with the heavy handed oak, makes it highly quaffable. To be honest, I wanted to hate this wine. But I can't. While it's clearly not balanced, it is easy. And only $5... I wouldn't pick it now, but I'm reminded of why I drank a lot of it in college. Earlier this year I was out in Santa Barbara and had the privilege of visiting Margerum's tasting room. I fell in love with a few wines, but none so much as the Riviera Rosé. Review: This rosé is the softest onion-skin pink color. It has fragrant aromas of juicy watermelon, purple flowers, and wet stone. On the palate it is softly sweet and chalk full of fruit -- more melon, fresh strawberries, and red currants. The Rivera is mostly Grenache, but also contains a bit of Counoise and Cinsault. To give texture, a touch of barrel aged Grenache is added in, too. This is what I wish all sweet rosés were like. The balance achieved between the acidity and sugar is beautiful. The flavors are just so bright and fresh. It's simply gorgeous. 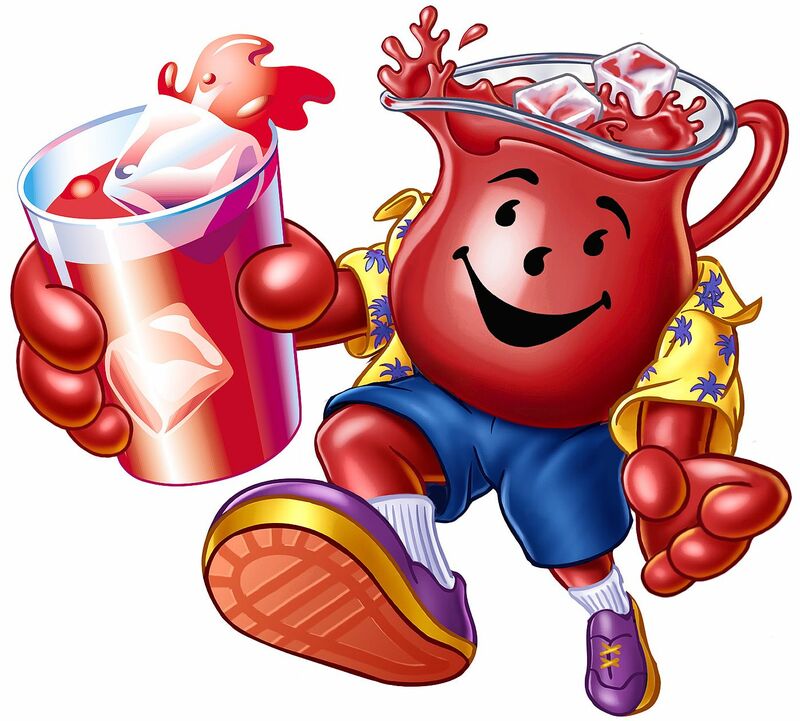 Food Pairing: A porch sipper if I ever had one. No food required. But if you wanted some, how about a nice spicy chili? Bottom Line: Oh so tasty. Sweet but lively, fresh and fruity. Are you looking for a moderately priced California chard with some of those buttery toasty notes? Well, I found it for you. The Angeline Chardonnay is the entry level offering from noted Russian River Valley producer Martin Ray. It's easy drinking and delicious with those classic California Chardonnay characteristics -- without being a butter bomb. Love. Review: This golden colored Chard has a nose full of lemon peel, fresh pineapple, white flowers and a touch of pastry cream. On the palate it is dry with surprisingly brightly acidity and a round body. It has flavors of ripe yellow peaches, slight oaky notes of clove and nutmeg and a hint of buttered toast. Made from fruit grown in California's cooler North Coast, the wine is aged partly in stainless steel and partly in French Oak barrels. It also undergoes a partial malolactic fermentation (where tart green apple like malic acid is converted into soft buttery lactic acid). The restraint shown in both techniques makes for my kind of Chardonnay. Food Pairing: This wine has a balance of creaminess and brightness that makes it ideal for virtually any pairing. Personally, I will be drinking mine with a grilled cheese sandwich! Bottom Line: A fine example of a modern California Chardonnay. I dig it. Review: On the nose the Reserve Des Cleons shows aromas of fresh green apples, meadow flowers, and candied lemon zest. On the palate it is dry and highly acidic with a surprisingly light body. The apple and floral notes are joined by ripe apricots and mandarin oranges. The finish is short and crisp. Overall, I enjoyed this wine. It's nice and refreshing. I did find the acidity a little high, though -- more mouth watering than is typical for this type of wine. That being said, it still does have that creamy touch I would expect. Pairing: While you could, I don't think I would want to put food with this wine. Just have a glass when you get home after one of those long Mondays. Bottom Line: Three words: Six Ninety Nine. Terre de Pierres -- Stones of the Earth. This Chardonnay is exactly that. The influence of Chablis' kimmerdgian clay soils makes for a wine chalk full of minerals and... you know... chalk. Review: This wine has beautiful rich aromas of ripe apricots, golden apples, white flowers, raw almonds, and, of course, minerals. The wine is dry and softly acidic with a round body. It has flavors just like the nose -- ripe apples, pears and apricots, a touch of lemon pulp, and a flinty finish. This wine was vinified exclusively in stainless steel (no oak) allowing the terrioir -- the varietal character of Chardonnay. and climate and soils of Chablis -- to shine. I think this is a gorgeous wine, right at the peak of its drinking potential. Yummy. Pairing: I'm not going to lie... I drank this with Teenage Mutant Ninja Turtle Mac and Cheese spiked with some bacon salt. Klassy, I know.. but it works. 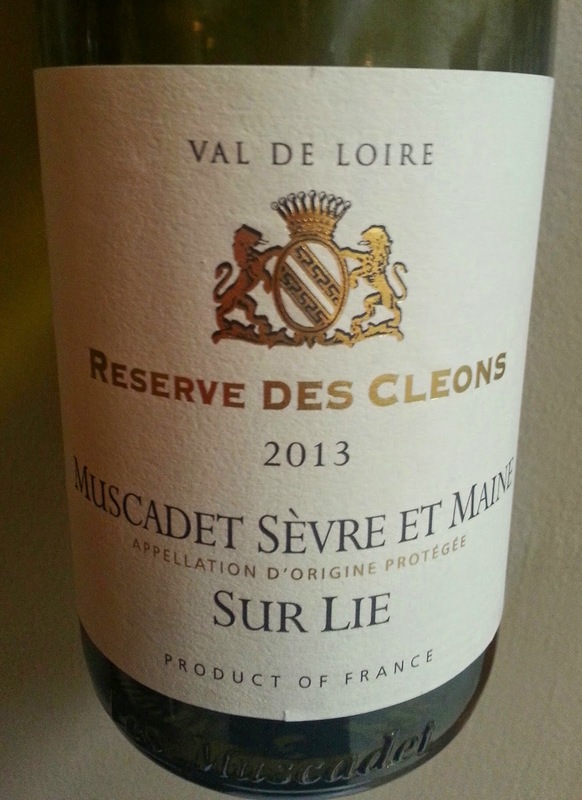 Bottom Line: A fantastic wine, full of fruit with a soft texture and zippy minerals. This is a rosé of Grolleau (95%) with a touch of Cabernet Franc thrown in for good measure. Grolleau is a red grape grown primarily in the Touraine region of the Loire Valley. It is used in red table wine in the region, but not allowed in AOC (Appellation d'Origine Contrôlée) production -- except for Rosé AOC's where Grolleau's naturally high acidity makes for balanced and bright wines. Deliciousness ensues. Review: This wine is the softest pinky salmon color. It has aromas of ripe cantaloupe melon and orange blossoms. On the palate it is medium sweet with a light body and mouthwatering acidity. The fruit flavors -- tangerines, white peaches, dried cherries -- all work together for a beautifully full flavored wine. I love the balance of acidity and sugar here. Bright and slightly sweet with tons of fruit. Yum. Food Pairing: The high acidity and fruit flavors make this wine a great pair for some charcuterie and melon. But you could also go the spicy route, as the sweetness here will be a great compliment to some heat. Bottom Line: Fruity, summery, easy. I dig it. 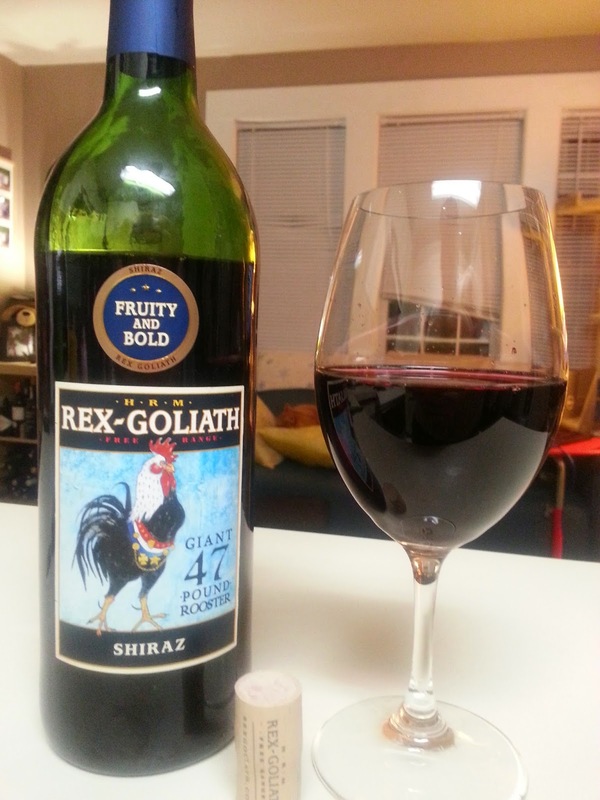 We've all seen the Rex Goliath wines in the grocery store. What's inside that giant 47 pound rooster? I'm going to find out (so you don't have to). Over the next few months I'm going to do my level best to review them all. 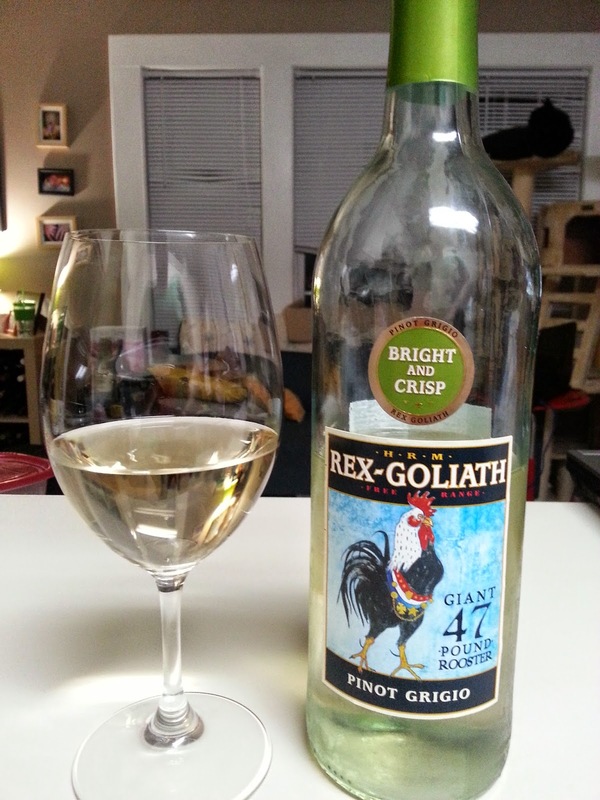 Here is Issue 1 of the Rex Chronicles: Pinot Grigio. Bottom Line: Not something I would choose to drink. But for only $5... well, no. I still don't want to drink it. But perhaps if it were chilled ice cold (Miller Light style) it might could be okay in case of a wine emergency.